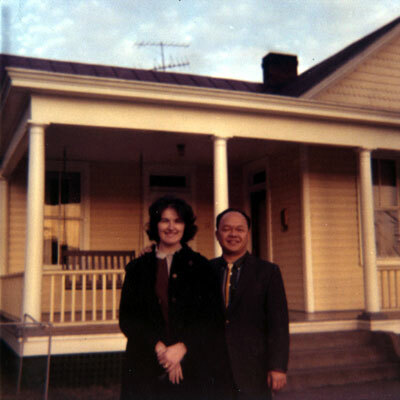 Ros came to Morgantown, West Virginia, August 1964, to complete his Doctoral studies in Music Composition which he had begun at Catholic University of America in 1961. His hosts Edith and Bill Vehse, met him soon after his arrival and helped him to get settled at Arnold Apartments. I had just completed my Master’s in Christian Education at Garrett Theological Seminary June, 1964, and was to begin my position as Director of Christian Education at Wesley Methodist Church. I arrived in Morgantown August 31 and my sister Betty, helped me to move into my apartment at 160 Fayette Street. Through the world of music, Ros and I began our relationship and continued unto union. Edith and Bill were members of Wesley Methodist Church and invited Ros to sing in the Adult Choir. This invitation was appreciated and accepted. I too had sung in choirs since my early teens so it was natural for me to join the choir. The first choir practice of the season was the occasion for our seeing each other. Ros was singing tenor; I was a soprano. I merely noticed Ros that Friday evening but was too busy to say hello to him. But he had realized that I was a trained singer and wanted to write some compositions for me. I was skeptical, but gave him some of my favorite Scriptural verses as a basis for his text. Within days, Ros came to me and asked if I would try his new solo written for me: “Search Me O Lord” – based on Psalm 139. What a joy it was to sing such beautiful music and to have a new friend who would accompany me! Ros told me later that he realized immediately when he spoke to me and surely when I sang his music that he wanted to marry me. In time, I began to learn much more about Ros’s life and his many achievements. He showed me some newspaper articles concerning his awards in the Philippines. I was astounded at his accomplishments and apparent fame. We continued to share music together; I enjoyed his sense of humor and warmth toward other people. He always had his camera with him and took lovely photos of me. I was not certain, but I realized that I had a special bonding with him before I called it “love”. But, the music of a composer became the music of my heart. After one long nine month period of struggle, we committed our lives to each other. 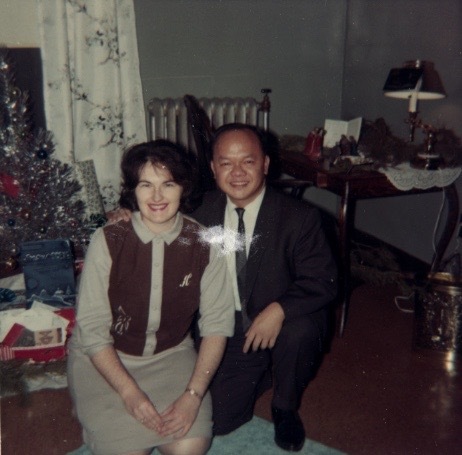 Ros and I decided to be married June of 1965, but we waited to announce the official engagement, December 18, 1965. All of our friends knew already but the long engagement period from December to June would give us the time to realize the full meaning of marriage and total commitment to each other. Both of us agree that the waiting period from June to June was the most difficult time of our lives and yet the most cherished. We began to find the meaning of trust, discipline and faith in each other. Our love matured with each month of waiting. For my Christmas present, I knew Ros would give me my engagement ring. The way in which he was to do it was the secret. I imagined some gallant approach to his official proposal of marriage, but Ros is not ultra-dramatic with the most important times of his life. He simply hid my ring under the pillow and when I placed it on my finger, he expressed his love. During our engagement, our telephone bill was bigger than ever, our visits more frequent, our correspondence greater, and our marriage plans more spectacular. Each day was marked off and reminded Ros that we had only a few days to go. The excitement and anticipation of future marriage was always present; yet, we were glad when June 5th arrived.